For many years now I have been exploring southwest Colorado with good friends (Charlie Fowler, Daiva Chesonis, Mark Dean, Joel Coniglio, Chris Boskoff, Rick Mendel and others). 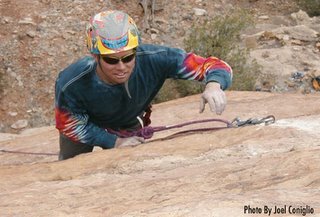 Together we have established hundreds of new rock climbs both in the mountains surrounding Telluride and in the desert areas around Paradox Valley and Big Gypsum Valley. Recently, my climbing and business partner Charlie Fowler and I started a media company (Mountain World Media LLC) through which we have published two guide books to rock climbing in the above areas. The Wild Wild West, published in late 2004, is a comprehensive guide book to over 500 desert rock climbs found in southwest Colorado (from Norwood west to the foot hills of the La Sal Mountains) . In late 2005, we published the third edition of Telluride Rocks—this expanded edition contains about 500 rock climbs, a brief coverage of bouldering areas and climbing information on 15 of Telluride’s most popular Mountains (Mt. Wilson, Wilson Peak, Lizard Head and many others). This blog is to be a dialog of adventures and exploration with friends. It is my intent to cover information on new climbing areas (the rock climbs therein), thoughts on issues ranging from photography to rock art and travels around the world. So fabulous to see you are still so passionate about your climbing. Would love to hear from ya....call me. Damon, great blog. So wonderful to learn that you are still enjoying climbing, the outdoors, and Colorado. Please give me a call or send an email so we can keep in touch.